Though it’s often confused with Veteran’s Day, Memorial Day is when we take time to remember those brave souls that died for their country. It’s not an easy thing, and perhaps a little painful, but by acknowledging those who gave of themselves, gave everything they had, it makes our own lives a little more worth appreciating. Here are 15 movies that offer a meaningful way to commemorate these heroes and their sacrifice. It begins with a rousing speech that rallies a class full of young men to join the army and serve their country in the Great War, but they quickly discover that life in the trenches is far from glamorous. The famous tracking shot following the charge into battle has been frequently discussed; it actually has the power to excite and rather dampens the movie’s anti-war stance. But another shot, involving a butterfly, is still remembered as one of the simplest and most powerful in any war film, then or since. Playwrights George Abbott (Damn Yankees) and Maxwell Anderson (Key Largo) were among the many who worked on the screenplay. 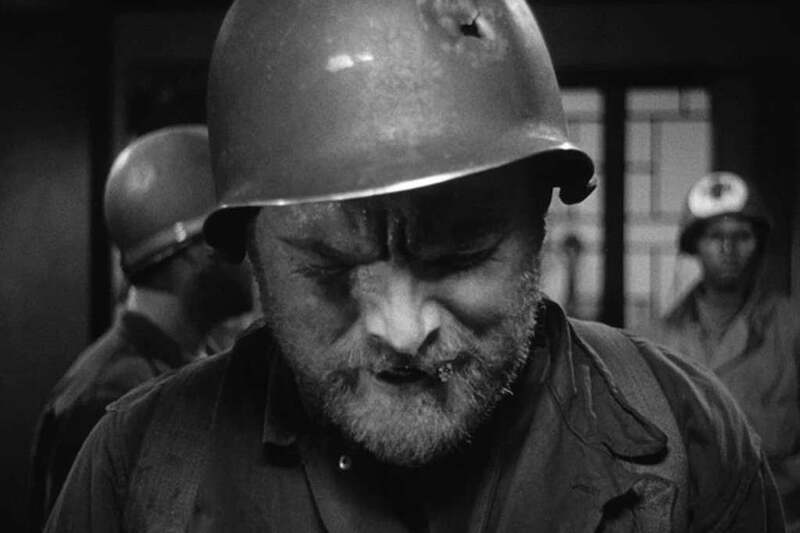 Jean Renoir’s masterful war-themed film La Grande Illusion (1937) has no battle sequences and is less about the horrors of war than it is about the difference between classes and nationalities (a subject that it still highly relevant). During the first World War, two French officers, Lieutenant Maréchal (Jean Gabin) and Captain de Boeldieu (Pierre Fresnay) are thrown into a prison camp, where they meet Rosenthal (Marcel Dalio), a wealthy Jewish couturier. Despite receiving preferential treatment, the men begin planning an escape. This is thwarted when they are transferred to an impenetrable German castle, run by Captain von Rauffenstein (Erich von Stroheim). However, another escape attempt is imminent. 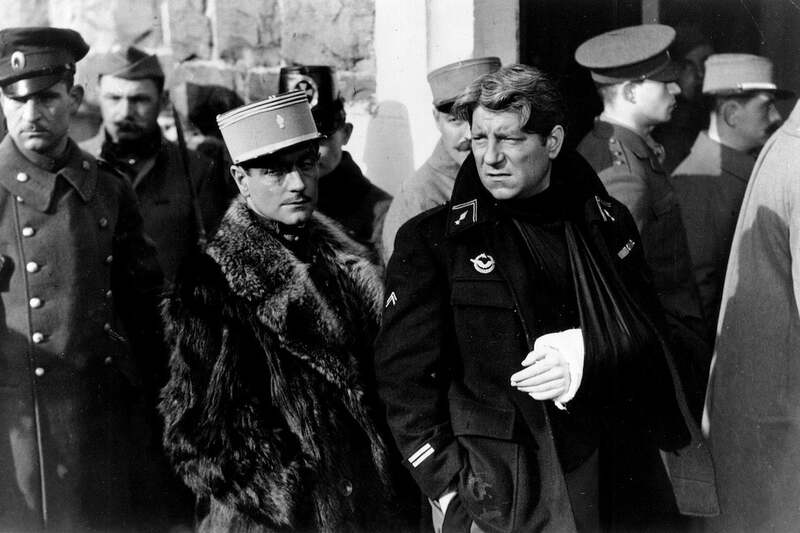 Stroheim is the movie’s ace-in-the-hole; the actor wears a robotic back and neck brace, white gloves (to hide battle scars), and his famous monocle, and yet his character is oddly sympathetic, and his scenes with the French prisoners are rather touching. It’s all due to the skill and genius of Renoir, who was perhaps the most humane of all directors. John Ford’s great WWII film They Were Expendable (1945) was shot and set at the tail end of the war, with his characters looking exhausted, bedraggled, unshaven, and utterly beaten. Playing Lieutenant “Rusty” Ryan, even the great John Wayne is shown at one point simply slumping to the ground. His co-star Robert Montgomery had only recently returned home from the real-life war. 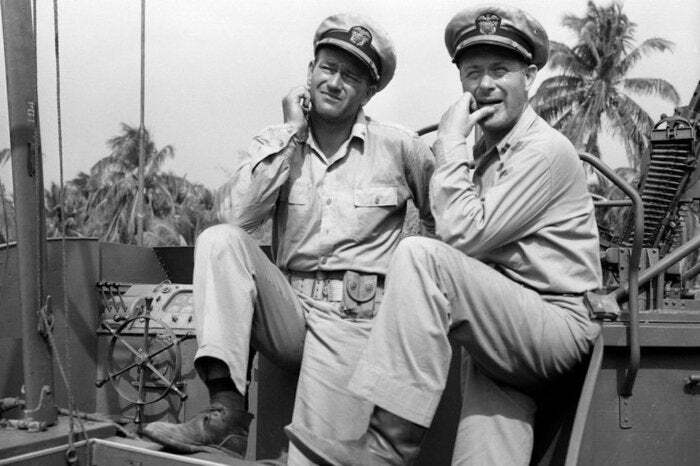 The movie is ostensibly about the introduction of PT Boats into the fighting, but it is really a beautifully complex depiction of war as something both exciting and horrifying. 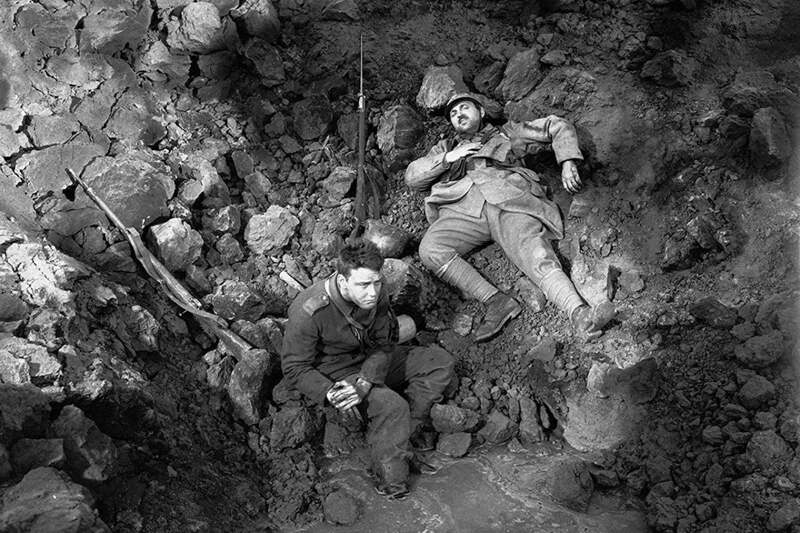 The luminous, shadowy black-and-white cinematography helps underline the differences between the perception of war and what actually transpires. It’s a remarkable film, but if viewers are looking for an alternate, and already subscribe to FilmStruck, Ford’s The Long Voyage Home (1940) is also available. Also starring Wayne and with legendarily great cinematography by Gregg Toland, this one is set at the war’s beginning and based on plays by Eugene O’Neill; it has a very different feel, but still equally poetic. Released in America as Stairway to Heaven, A Matter of Life and Death (1946) is one of the most enchanting, imaginative wartime movies ever made. 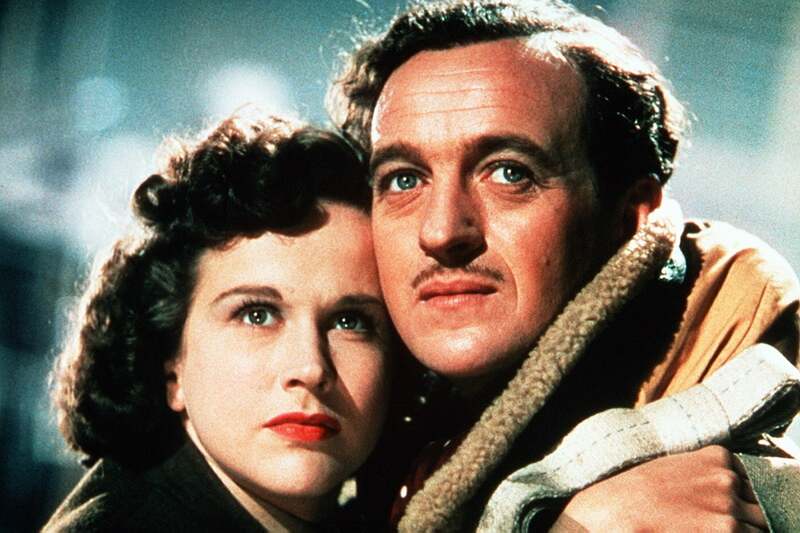 Nosediving in a malfunctioning plane, a British pilot, Peter Carter (David Niven), speaks to a sweet-sounding American radio operator (Kim Hunter), and they fall instantly in love. In the morning, he inexplicably walks out of the ocean, alive, and meets the girl in the flesh. Apparently, Carter was supposed to have died and gone to heaven, but a mistake was made. He argues that because he’s fallen in love, he has a right to stay. The case goes to trial in a heavenly court, with help from Carter’s doctor (Roger Livesey). Powell and Pressburger paint their cinematic Heaven in black and white and Earth in lovely Technicolor, the opposite of what one might imagine, largely in an attempt to celebrate the joy of life. The film also features astonishing visual effects, none more memorable than a “stairway to heaven,” which escalates itself infinitely through the clouds, past giant statues of philosophers and other potent images. 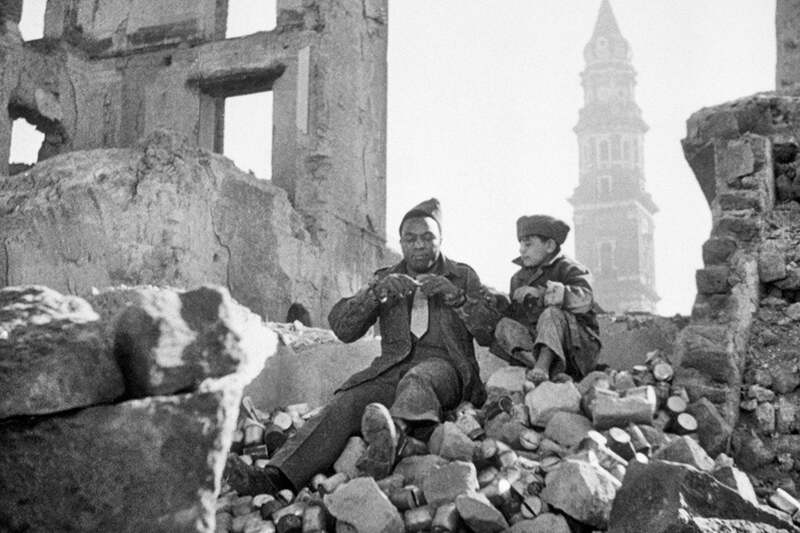 Roberto Rossellini’s second feature film—and the second of his “war trilogy” (after Open City and before Germany Year Zero)—Paisan (1946) is an anthology film consisting of six tales about the meeting of Americans and Italians during WWII. (“Paisan” is a term of friendship.) In one, an American soldier tries to protect an Italian woman, though neither of them speaks the other’s language. In another, a black soldier comes across a boy thief. And in another, three American chaplains spend the night in an Italian monastery (the monks are incredulous when they discover that two of the chaplains are protestant and Jewish). In the best crafted story, a weary, drunken soldier searches for a girl and falls in with a prostitute without realizing that they are one in the same. Though it’s a prime example of the Italian Neo-Realism movement, Rossellini’s handling of the actors is sometimes awkward, and he has a penchant for melodrama and for swelling music. But the genuine feeling of human warmth is unmistakable. The writers, including Rossellini and Federico Fellini, received a Best Screenplay Oscar nomination in 1950. A young Korean boy, whom he nicknames “Short Round” (William Chun), begins to tag along with him and the Sarge reluctantly, grumblingly, allows it. They come across a platoon of other soldiers, a wide cross-section of various and assorted cultures, and together they establish a base in a beautiful Buddhist temple. There, the men’s internal conflicts and prejudices bash up against the real, external conflict. It’s a smart, tense film, but Fuller’s later, full-color The Big Red One (1980) (Rental: iTunes, Vudu, Amazon Prime, etc., from $2.99), based on his own experiences during the war, is also highly recommended. 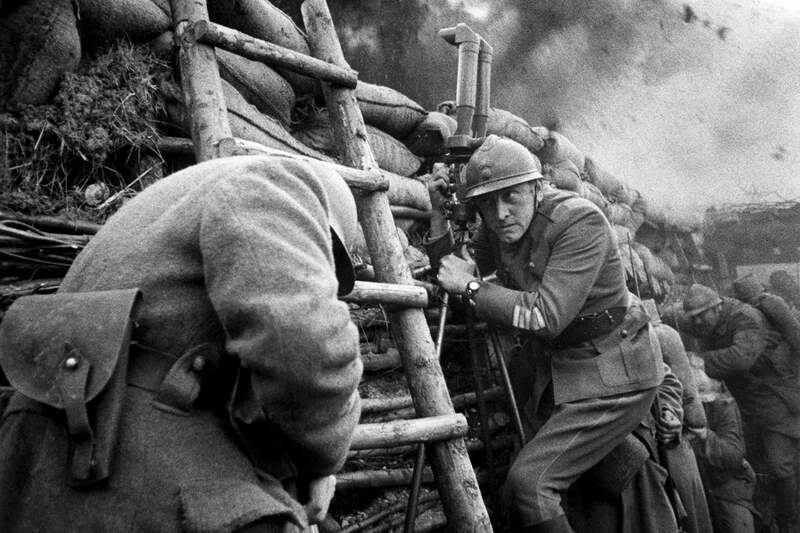 Without question a masterpiece, and one of the greatest war films of all time, Stanley Kubrick’s Paths of Glory (1957) is swift and merciless in its condemnation of the behaviors of war, and yet without a hint of preaching. During WWI, a general (Adolphe Menjou) orders an attack that will surely be a suicide mission; when it fails, he furiously orders a court-martial. Three scapegoats (Ralph Meeker, Timothy Carey, and Joe Turkel) are chosen, for reasons having little to do with the mission, and it’s left to Regiment Colonel Dax (Kirk Douglas) to try to defend them during their trial. The extraordinary black-and-white cinematography captures the cavernous, fluid spaces in which all this blame-passing and hubris occurs, and legendary pulp novelist Jim Thompson co-wrote the vicious screenplay. It wraps up with an indescribably moving sequence in a cantina involving a German singer; she’s played by Christiane Susanne Harlan, who married the director the following year. This is unmissable.